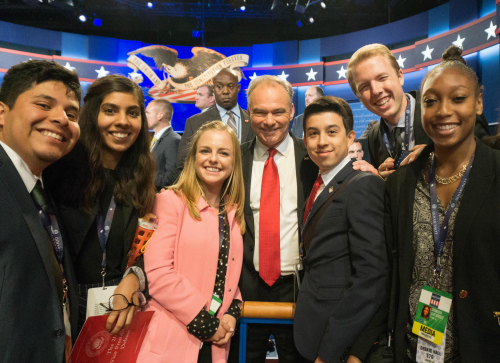 UC Santa Cruz politics major Austin Downs, second from right, with Democratic vice presidential candidate Tim Kaine, center, attended the debate as a student at UCDC, UC's Washington Center. When Austin Downs (College Ten, ’17, politics) arrived in Washington D.C. in August little did he know he would attend the vice-presidential debate two months later. Downs was in town to attend the UC Washington Center (UCDC), the University of California’s teaching and research program in the nation’s capital. Every quarter, nearly 300 UC students come to the center to participate in the city’s rich cultural, political, and international heritage through internships and seminars. Downs was one of eight UCDC students to attend the debate held at Longwood University in Farmville, Va. Earlier in the year, C-SPAN’s political editor and UCDC instructor Steven Scully devised a contest asking UCDC students to guess the presidential candidates’ VP picks. The right answer would win a spot in the audience of the only VP debate in this year's election. Downs correctly guessed Hillary Clinton’s running-mate, Tim Kaine. “He was a good match for the ticket,” said Downs about about his educated guess of the Virginia senator. “He was from a Southern swing state, and was a possibility for Obama.” It was all luck from there. More correct guesses were submitted than tickets were available so eight students were selected randomly. “After years of watching televised debates, it was surreal to be in the room,” he said about seeing the candidates battle face-to-face over issues from national security to the economy. “You are aware of the candidates’ body emotions that are not available in TV cuts,” he said. When Downs is not attending debates, he is interning at the Council on Hemispheric Affairs, a research organization dedicated to Latin American and U.S./Canadian policy relations. He helps senior research fellows write articles and draft policy briefs. He is also taking a research seminar on international policy, a field he hopes to explore in more depth when he graduates. While it may be hard to beat watching the debates in-person, Down says there is always something exciting to do at the center. There are organized field trips to Arlington Cemetery and Mount Vernon, George Washington’s birthplace, night tours of Capitol Hill, plus other special events and lectures. This quarter, guest speakers include New York Times Congressional correspondent Jennifer Steinhauer. Supreme Court Justice Stephen Breyer, Mexico’s Ambassador to the U.S. Carlos Sada, and Brian Lamb, founder of C-SPAN. “Many of our students do not have the personal or family connections to get access to these opportunities on their own,” says UCDC’s executive director Helen Shapiro.